The 26-year-old 11th Panchen Lama has significantly increased his role in religious assemblies and social activities in past year. As the 81-year-old 14th Dalai Lama becomes less active on the world stage, the Panchen Lama, the other top ranking figure in Tibetan Buddhism, is garnering greater popularity and building up his credibility among Buddhist believers. Unlike other men his age who want a well paying job and a hot girlfriend, his dream is that "the world is peaceful, our motherland is stable, people live in harmony, Buddhism is prosperous." "This is what I will pursue for my whole life. I will devote everything to it," the 11th Panchen Erdeni Gyantsen Norpo told reporters seven years ago. After years of study and practice, he has become ever more confident and true to his name. The Living Buddha, 26, who long kept a low profile, has gradually increased his involvement in public life. He spent the past two weeks in Nagqu Prefecture and Lhasa, both in Southwest China's Tibet Autonomous Region, talking with officials and monks, and visiting temples, schools and a hospital, according to State media. Before that, he hosted a religious gathering at the New Palace of the Panchen in Xigaze, Tibet which attracted hundreds of thousands of attendees. Some speculate that these actions have been encouraged to counter the influence of the Dalai Lama and prepare for a post-Dalai Lama era. 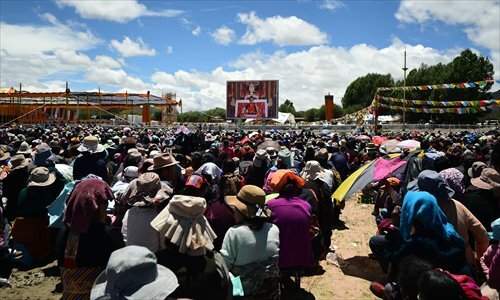 These activities can help the Panchen win greater recognition among Tibetans but it may prove difficult to persuade them to abandon their faith in the Dalai Lama, according to an ethnic minority affairs commentator who uses the pseudonym Zhou Quan. "It's not a straight choice between the two for the worshippers," Zhou told the Global Times. To them, the Dalai and Panchen lamas are the highest leaders of the Gelugpa, or Yellow Hat sect, the most prominent school of Tibetan Buddhism. Xu Zhitao, deputy director of the Bureau of the Tibetan question at the United Front Work Department of the Communist Party of China Central Committee (UFWD), said the Panchen Lama will progressively increase his public exposure. "As he grows up and shoulders more social positions, in addition to political and religious titles, he will get involved in more activities and generate more media coverage," Xu told the Global Times on Monday. Between July 21 and 24, the 11th Panchen Lama hosted the Kalachakra (wheel of time) ritual at the summer place of the Panchen Lama in Xigaze at the request of the monks of the Zhaxi Lhunbo Lamasery, the historic home temple of Panchen Lamas. It was the first time in 60 years that the ritual was performed in Tibet. During the highest-level ritual in Tibetan Buddhist Tantrism, the Panchen conducted a series of teachings, initiations and empowerments, which supposedly assist Buddhists pass through the cycle of life. A total of 5,000 lamas and 100 tulkus (Living Buddhas who are believed to be the reincarnations of religious figures of the past) joined the ritual. Believers came from across the country, and the cumulative attendance over the four days was 426,000, according to the Xinhua News Agency. However, some media outlets criticized the event. Quoting three people, including two Tibetans living in India, Firstpost, an Indian news organization, said that the Panchen Lama was not "entitled" to give the ritual as he is a "fake" Panchen. It also claimed that the "Chinese authorities have made it mandatory for each (Tibetan) household to send at least two members to the religious congregation to ensure a 'decent' turnout." "They have long been politicizing the Panchen's activities, even though they are purely religious," responded Xu. "Whether the believers went voluntarily or not, whether they were satisfied or not, they themselves have the last say." Hongsong from Yushu in Qinghai Province told Xinhua that he and his family members decided to go to the ritual when they heard about it in early July. "It's so precious," he told Xinhua. "The blessings from my previous life and affinity to Buddha mean that I can receive attunements from the Panchen during my lifetime," said 51-year-old Aga, a herdsman from Nagqu in northern Tibet. Born to a nomadic family in Lhari county in Nagqu in 1990, Gyantsen Norpo was recognized as the reincarnate of the late Panchen Lama on November 29, 1995. However, pre-empting the Qing-Dynasty era lot-drawing process, the Dalai Lama announced that another boy, 6-year-old Gedhun Choekyi Nyima was the Panchen. At a press conference held in September last year in Beijing, a Tibet official claimed that Nyima is living a normal life, growing up healthily and doesn't want to be disturbed. The People's Daily said in a 2008 report that the Dalai Lama ignored historical precedent in this case. This hostile controversy has led to some groups refusing to recognize Norpo as the real Panchen. However, these noisy controversies didn't affect the childhood and adolescence of Norpo, who has mastered Tibetan, English and Putonghua as well as developing a rich knowledge of Tibetan Buddhism. In recent years, it seems that the Panchen has become more and more accustomed to his role. In addition to holding religious assemblies and attending meetings inside and outside Tibet, he has also become politically active. On February 3, 2010, the 20-year-old was elected vice president of the China Buddhist Association. Weeks later, he was elevated to China's top advisory body, becoming the youngest political advisor in China. In May last year, he visited the CCPA&BCCCC (Chinese Catholic Patriotic Association and Bishops' Conference of the Catholic Church in China) and talked with bishops, calling them to join hands with Buddhists to better serve believers and the country. In March this year, he attended a religious discussion at the Boao Forum for Asia in Boao, South China's Hainan Province and shared his understanding of "goodness" and how to be a spiritual leader, and cautioned of risks the high-tech weapons pose to world peace. At the annual two legislative sessions, he submitted proposals and addressed group discussions. In his proposal last year, he pointed out that China doesn't have enough lamas and nuns to meet the rising demand of the Tibetan Buddhist believers and suggested specific measures to expand the talent reserve, which won support from some Tibetans. Zhaluo, a Tibetologist from the Institute of Ethnology and Anthropology, the Chinese Academy of Social Sciences, believes that these activities will help expand the Panchen's influence. "Just like political figures, religious leaders' power also come from their understanding of social affairs and contribution to the society," Zhaluo told the Global Times. "The Panchen is shifting his priority from learning to focusing on people's livelihood and Tibetan Buddhism, which will make him more influential." Still, some observers say his influence still falls short of that of Dalai Lama and the 10th Panchen Lama. "It's not comparable as the age and experience gap is there. His knowledge and credibility will increase as time goes by," said Lian Xiangmin, an expert at the China Tibetology Research Center. Guangdong-based businessman, Sumkyi Tashi, who studied to be a lama five years ago, believes the Panchen Lama fulfills the requirements of his role. 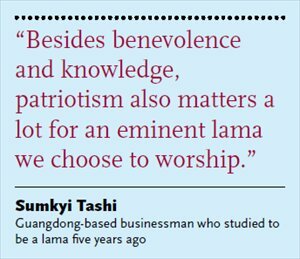 "Besides benevolence and knowledge, patriotism also matters a lot for an eminent lama we choose to worship," he told the Global Times. Lian said the tulkus are also Chinese citizens and should abide by secular laws while following religious doctrines and disciplines. 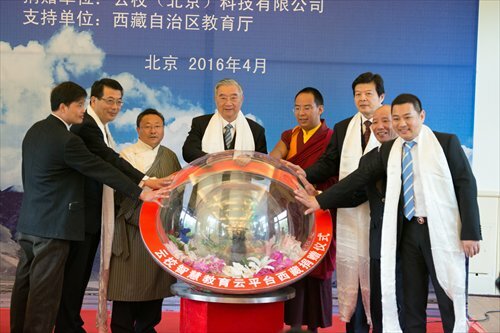 "I'm sure how the Panchen was raised will set an example for the next Dalai Lama," said commentator Zhou Quan. Official Xu Zhitao said Norpo's education and childhood were special due to the Dalai's interference and the country has gone to great lengths to ensure his education and healthy growth. "The mode can not be duplicated. There are more than 1,000 tulkus in China. It's impossible for the country to do it to all. There is a traditional way for them to grow up." Unlike other tulkus who are now usually educated in official Tibetan Buddhism colleges from childhood on, Norpo was privately tutored in his residence. According to an article written by Jing Tingyao, a veteran painter with PLA General Logistics Department, about his experience visiting the Panchen Lama in 2010, the lama is protected by State Security workers and plainclothes policemen. Xu said the government has been hands off with regards to Panchen's religious activities. "Before adulthood, mentors and abbots helped him with activity arrangement. Now, they are mainly up to him. But when he wants to attend social activities, such as visiting a school or development zone, he will negotiate with us," he said.